Singapore is one of the safest major cities in the world by virtually any measure. Singapore uses the British BS1363 three-pin rectangular socket (230V/50Hz). Do You Need a Visa For Singapore? Singapore has a relatively-easy visa policy. Most nationalities can enter Singapore without a visa and stay visa-free for up to 30 days. If you hold a passport from the US, European Union members states, Australia, Norway, Switzerland, or South Korea you can stay for up to 90 days. When you enter Singapore you will fill out an immigration card. Be sure to keep it after immigration clearance, you will need to show it when you leave. Also, super incredibly important to know, Singapore has very VERY strict drug laws. If you are caught with drugs while traveling even through Singapore airport you will be charged and it carries a mandatory death penalty. Please be aware this is applied to everyone, including foreigners. If you are bringing medication with you on vacation to Singapore be sure to carry your prescriptions with you. Also, if you are bringing sedatives (eg Valium/diazepam) or strong painkillers (eg codeine) you should obtain prior permission from Health Sciences Authority. What Are Temperatures Like In Singapore? Singapore is hot. It is located extremely close to the equator so typically you'll see mostly sunny days with no distinct seasons. It does rain almost everyday of the year, but the heavy and sudden showers rarely last longer than an hour. Between May and October, forest fires in neighboring countries can cause dense haze. This makes the air quality pretty poor, even reaching unhealthy levels regularly. Do know that it is unpredictable and may come and go rapidly. Because the island sits so close to the equator it is hot year round — meaning there really isn't a low season. Room rates generally stay pretty high due to high demand year round. They do reach exorbitant prices during Chinese New Year. If you do try to pin down a specific high season it would be November - April since many in the states and UK are traveling looking for warmer weather. Singapore is Southeast Asia's largest aviation hub and you will most likely be arriving to Singapore via plane. The main airport is called Changi Airport (Code: SIN) and this isn't any normal airport. It has been named 'best airport in the world' (Skytrax) and is an attraction in Singapore itself. I promise you will want to make time to explore this airport, just check out their Instagram for proof. Changi Airport has everything. Multiple themed gardens - my favorites include the cactus garden on the roof and the butterfly garden which holds more than a thousand butterflies. A 12-meter high slide. A Kinetic Rain art installation. There's even a full-on play, Peranakan Love Story - a tale of two young adults set in Singapore in the 1930s, done in collaboration with Singapore’s local talents. So yeah, lots to do here. If you do wish to go this route, the closest city in mainland China to Hong Kong is Shenzhen. There are 6 land checkpoints between Hong Kong and mainland China. Be sure to note the opening hours of the border crossing before starting your journey. Airport Shuttle leaving every 15-30 mins which brings you directly to the doorstep of certain designated downtown hotels. This option is available 24/7, and is seriously a convenient and affordable option (Adult $9, Children $6). 4-seater ($55) or 7-seater ($60) vehicle to any destination in Singapore. Limousines that charge a flat $50 to any destination in Singapore. Taxi: This option is easy just simply follow the signs after clearing customs. You'll find that meters are always used in Singapore and prices are reasonable. There is a $3-5 surcharge for the airport and an additional 50% surcharge applies between midnight and 06:00. Do be aware that the lines for Taxis can get pretty long (especially after midnight) which is why I suggest using the Ground Transport Desk. Subway: This option is only avalible between 5:30 AM and 11 PM. MRT trains are located between T2 and T3. Once on you'll need to change trains at Tanah Merah to a city-bound train. Read carefully: exit through the left hand side door and cross the platform. The ride takes around 40 minutes (to City Hall station) and costs $2.30. Using public transportation to get around Singapore is easy. CityMapper Singapore and Google Maps does a pretty good job of figuring out the fastest route by MRT and bus and even estimating taxi fares between any two points. I suggest buying the Ez-link card or a Nets Flash Pay card. If you are familiar with Hong Kong's Octopus card or London Underground's Oyster card you will understand the concept quickly. The thick plastic cards store value and can be topped off in increments of at least $10 at any vending machine or even in 7-Eleven stores. You can even use the same card for up to 5 years if you are planning to visit Singapore multiple times. 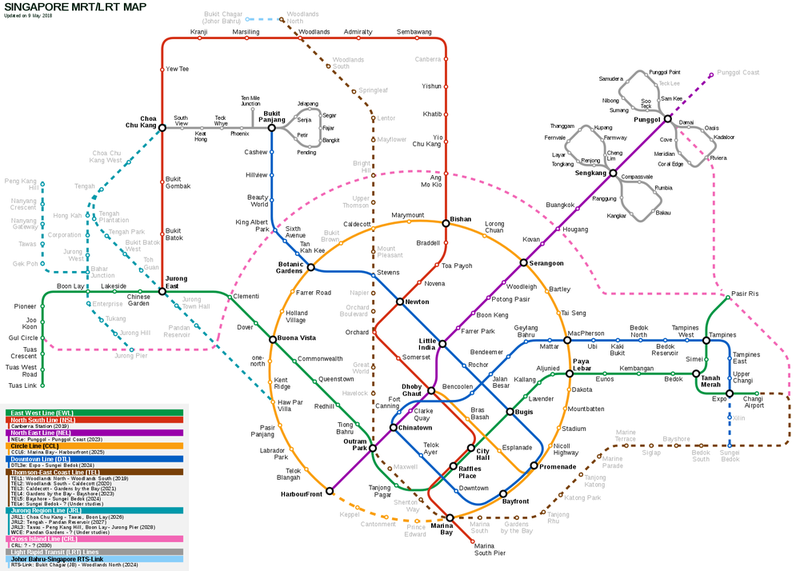 The MRT (Mass Rapid Transit) and LRT (Light Rail Transit) are where you will be spending most of your time. The rides are cheap, all the lines are integrated, and it's a very reliable mode of transportation, and the network covers most points of interest for the visitor. You'll use your Ez-Link card and simple tap to scan your train ticket at the gate when entering and exiting the train service area. You'll find bumboats cruising the Singapore River, offering tourists point-to-point rides starting from $3. They also have an option for cruises with nice views of the CBD skyscraper skyline starting from $13. The taxis in Singapore are a great option. They all use meters and drivers are generally an honest bunch. There is a shortage of taxis in Singapore and it's not rare to be unable to hail one for hours. If you can find one they are pretty cheap and trips in the city center won't cost more than $10 (as long as you aren't traveling during weekday peak hours). Even a trip clear across the island will only run you around $35. If you are in a group of 3-4 you may want to take a taxi over public transport because it is cheaper. When it comes to communicating with Singapore taxi drivers it is helpful to have the address of your location written down. Ask the concierge of your hotel to do so before you leave and try to keep a hotel card (or check your room key) for the hotels address to show them. Singapore used to have Uber but starting in April of 2018 Uber consolidated with their major competitor called Grab. Make sure you download the Grab ride-hailing app before you arrive in Singapore. Prices are reasonable and most international credit cards are accepted on the app. You can even pay using cash! Most importantly, Grab covers all of Singapore making it an easy way to get a cab no matter where you are. If you are planning a vacation to Singapore one of the most important questions you'll ask yourself is where in Singapore to book your hotel room. Accommodation in Singapore is expensive by South-East Asian standards — but even still you'll find some budget options. Hostels will be your cheapest options. They are generally found in Little India, Chinatown, Bugis, Clarke Quay and the East Coast. Beds are between $25-40 for a shared room. For a mid-range option (think around $100 or more a night) you'll be reduced to a variety of older hotels. I suggest checking out the Holiday Inn Singapore Atrium. If you want to splurge boy do you have some options... Raffles Hotel (a location in the hit-book and major motion picture Crazy Rich Asians) is an iconic location you should definitely look into. Marina Bay Sands is also a must do if you really want luxury. It has the worlds largest and highest infinity pool and extremely decadent rooms. There is no short list of things to do and see in Singapore. There really is something for everyone. There are way too many different types of food to list, Singapore is truly a foodie heaven. If you do anything while in Singapore make sure you visit a hawker center. If you saw Crazy Rich Asians, (or read the books) one of the first things Rachel and Nick do once touching down in Singapore is head to a food court of hawker stalls. You should also! Nick even says in the movie: It's the only place in the world where food stalls have Michelin stars. And he wasn’t kidding. While the stalls don't have full on stars they do receive Michelin Bib Gourmand awards - recognition for establishments offering a ‘high-quality menu at a reasonable price’. (For Singapore that means $45 or less). There are a total of 17 Bib Gourmand awards spread out among the various food centers in Singapore. By the way, the one they visit in the movie is Newton Food Centre. This one is Singapore's most famous hawker centre. The structure was built in 1971 but the stalls date back to 1960's. It's also the only comprehensive Singapore food centre that offers a one-stop diverse mix of streetside foods from Chinese, Malay and Indian hawkers. If you do choose to check out Newton Food Centre be sure to visit Alliance Seafood and order the barbecued seafood and black pepper crab ($36 for a 750-800g crab) which earned the stall its Michelin Bib Gourmand award. Older PostBlue Hole VS Dunn's River Falls | Which is best?